This is an expansion and requires Battlefield 1942. 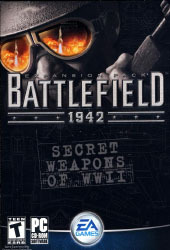 Battlefield 1942: Secret Weapons of WWII lets you control the most bizarre and lethal top-secret weapons of the Second World War. Straight from Allied and Axis laboratories, many of these weapons never saw combat until now! Defeat your enemies with a variety of experimental firepower, including the Wasserfall Guided Rocket, the Natter Rocket Plane, and the revolutionary Rocket Pack. Drop from a cargo plane behind enemy lines and prepare for close combat with one-shot-kill knives, new machine guns, and more. Give all of these weapons and vehicles a trial by fire on eight tough new battle maps.